It's 30-ish degrees outside, I wouldn't blame you for being confused. Are we really in England?! Yes we are, we really really are - our air conditioned [not.] beloved public transportation has been my favourite part of #thatheatwavelife. However, when an invite comes your way to dine at a new Brazilian hotspot in Brixton, it's almost as if the weather has answered my calls - a cool caipirinha and yummy spicy food could just hit the holiday-vibes spot nicely. I'd been to Brixton Village but not specifically to Market Row before [or at least I don't think so!]. After what seemed like the longest, hottest journey across London I found myself first getting lost in amongst the market places [even with a map] and then finding a little colourful haven to celebrate #FiestaTuesday! 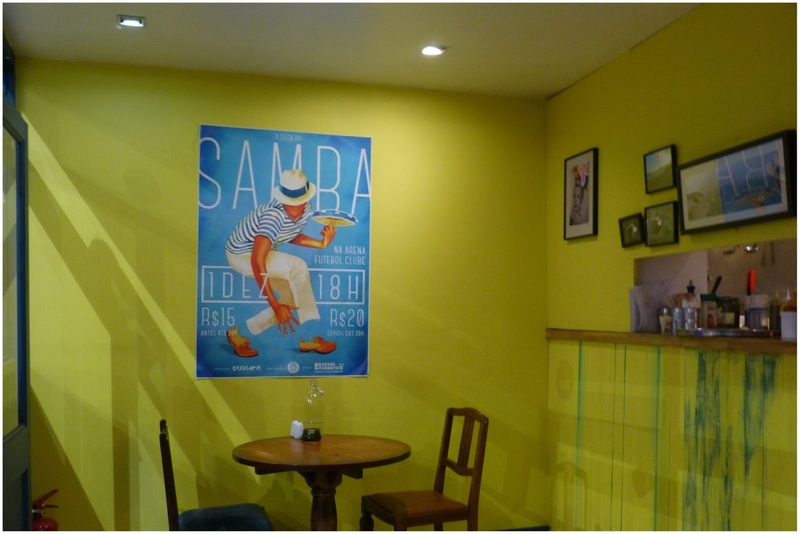 Read on to find out what we ate and get your Brixton Brazilian vibes on. Luckily for me, I wasn't the only late arrival [thank you to the lovely Alex of Epicurienne] and because we were both so late we ended up getting the dishes as they would be served in the restaurant rather than in shared-platter style, creating a little date atmosphere at one end of the table [so much for socialising, ha]. We were quickly handed delicious caipirinhas and soon after the food rolled in. 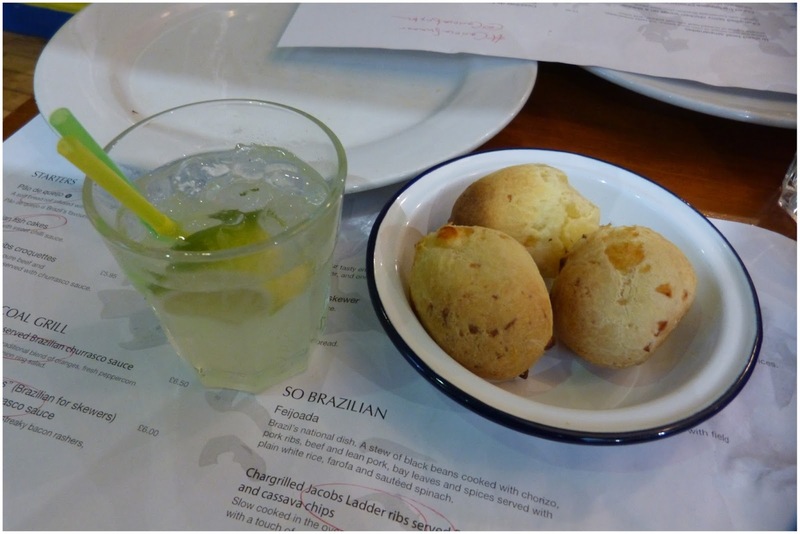 pão de queijo, a soft bread roll infused with mature cheddar cheese, aka Brazil's favourite savoury appetiser. // cute little starter, quite rich with the cheese but very tasty combo with the caipirinha. 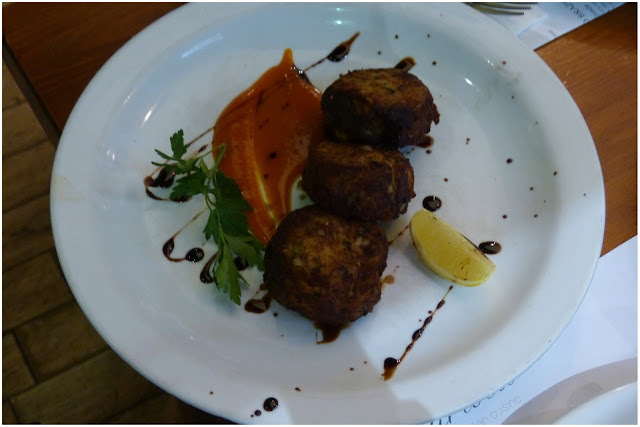 bahian fish cakes, served with sweet chilli sauce. 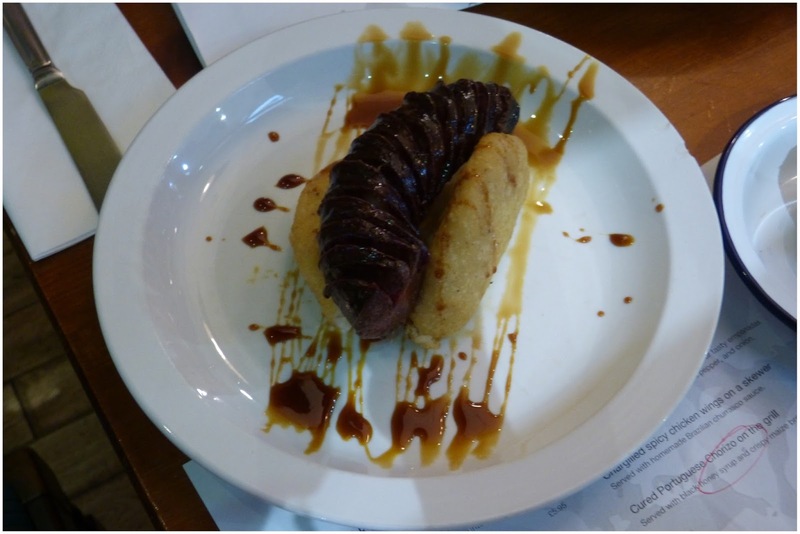 // probably my least favourite of the evening - the consistency in the middle was a little too soft for me but still flavoursome and the sauce was sweet but punchy, a lovely add. 1/2 chargrilled spicy chicken served with Brazilian churrasco sauce, sauce is a traditional blend of oranges, fresh peppercorn and spices, served with battered gluten free onion ring salad. 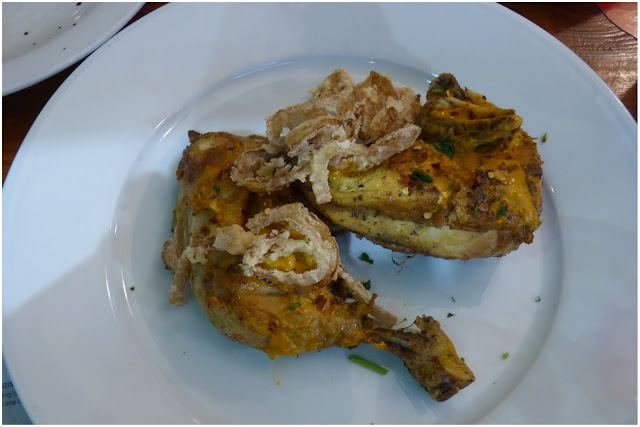 // succulent chicken with that lovely sweet-and-spicy flavour, topped with yummy crunchy onion rings which gave the dish a great added texture. 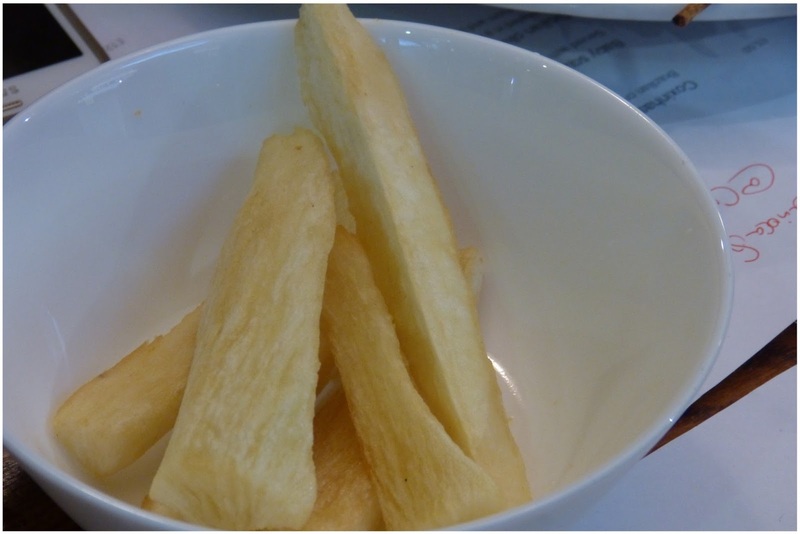 cassava chips. // I'm a big fan of the alternative-chip [sweet potato, courgette, etc. they're all fun]. This was the first time I'd tried cassava chips [like actual chip-style and not in a crisp packet] and I'm not used to having it dry [usually I've eaten it like a soup]. It's a bit like a hybrid between a parsnip [but less sweet] and a potato chip but overall significantly more starchy. I enjoyed but didn't knock the sweet-potato-chip off no. 1 position. fresh mango, tomato and avocado summer salad, seasoned with coriander, olive oil, chilli and fresh lime. // a simple fruity salad which complimented the chicken and cassava chips really well - added some clean, fresh flavours to the whole main. 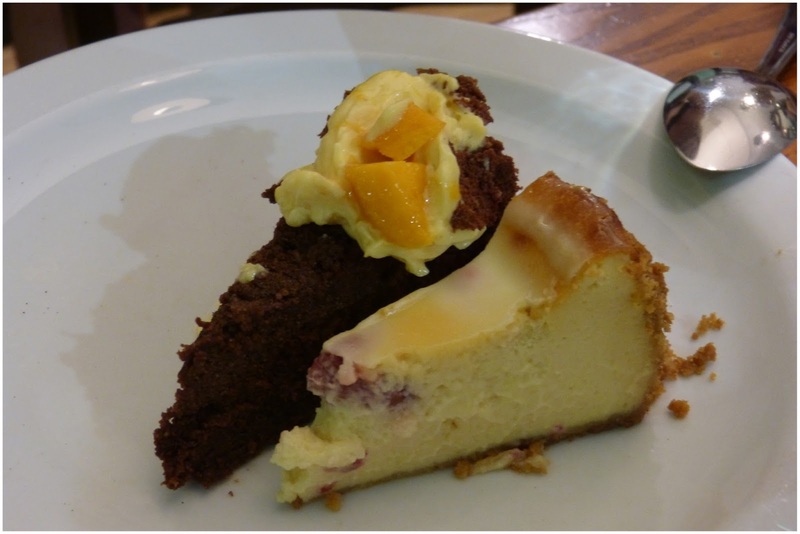 homemade chocolate cake and raspberry cheesecake. // when you're told the chef who made dessert made his own wedding cake, expectations are raised. Lucky for us, it didn't disappoint. Both the chocolate cake and the raspberry baked cheesecake [yes, we were double-cake-parked] were super moist and delicious. Maybe a little too big a portion to end a big, filling meal but very yummy! All in all, it was a great little Tuesday evening out. 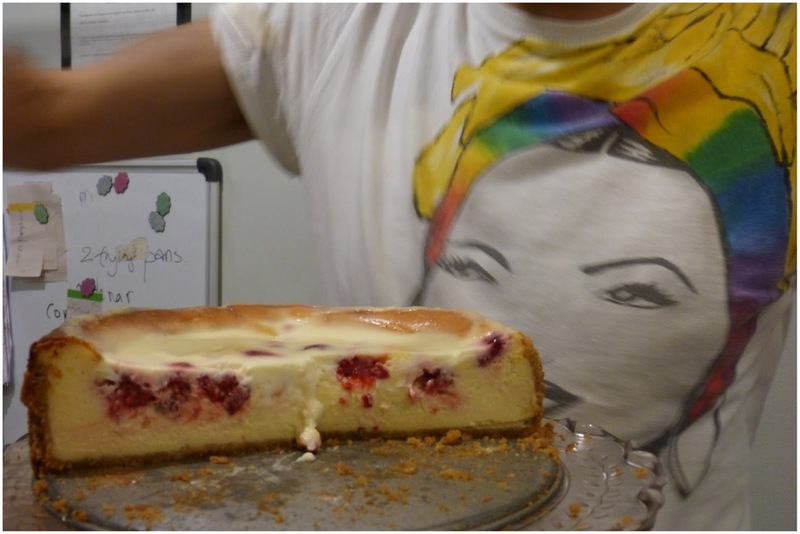 Big thanks to Chris of tikichris, Kate, Alex of Yelp and most of all to team Carioca Brixton for showing us a fiesta-good-time! hope you're all enjoying this heatwave, ai ai ai!